Despite the breeze, sweat glistened on the men’s backs. Hooves thundered on the ground as their horses jumped while the men held each other in a strong grip, trying to wrestle their opponent to the ground. As I watched, I couldn’t help but think about how accurately these horse games represented Kyrgyzstan. Wrestling horsemen, shouting spectators and all around us a stunning mountain scenery. Kyrgyzstan is a country not to be missed. If you even remotely enjoy nature and a unique culture, you will want to spend some time exploring the country’s highlights. One of the best ways to enjoy Kyrgyzstan’s nature is to go on a hike. You don’t have to travel far to find stunning mountain scenery. 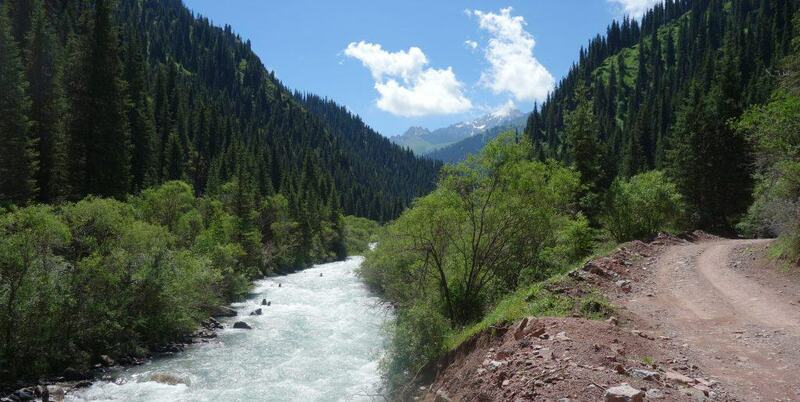 The Ala-Archa National Park is an easy day-trip from Bishkek with the additional option of an overnight stay. Stunning mountain scenery and trekking paths can be found all over the country, from the high meadows of Lake Song Kul to the walnut forests of Arslanbob. Hikes vary from easy day trips to more challenging treks lasting a couple of days. Kyrgyzstan’s CBT (Community Based Tourism) can help you arrange guides and overnight stays. 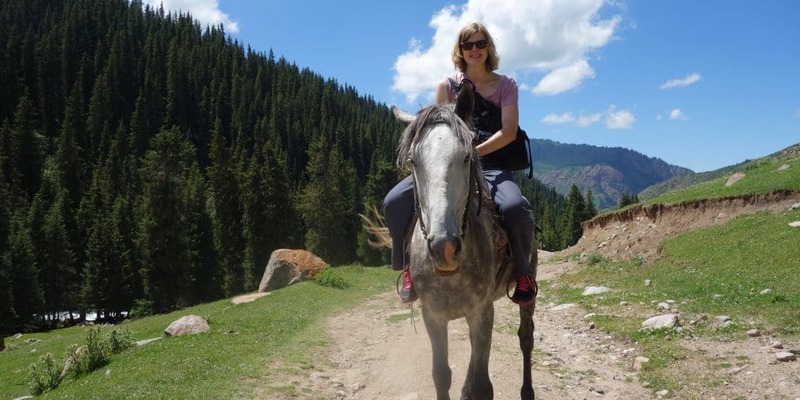 If you don’t want to go hiking, explore Kyrgyzstan the way the locals do – on the back of a horse. Horse-riding can easily be arranged everywhere in the country. Don’t be afraid if you’re a beginner. I was scared of horses and still had a great time. Since most locals start riding at a young age and spend a lot of their time on the back of a horse, they are very experienced and helpful. I went horse-riding in Jeti-Orguz. The local kids, who spend their summer holidays in this mountain valley, guided our horses through the forest and across several rivers. The ride was far longer than I had expected and I was exhausted by the end of it, but the rewarding glacier views made it worth it. With Kyrgyzstan being a country of horsemen, it is no surprise that horse games are deeply anchored in their culture. I was lucky to see a game of goat polo while staying at Lake Song-Kul. The game is played with the body of a dead goat. Two teams of horse riders wrestle over the goat’s body, trying to get a hold of it and carry it to one end of the field. The game is brutal, with horses clashing into each other and the players almost falling off their horses, but it is fascinating to watch. It is not difficult to find remote mountain valleys in Kyrgyzstan. The country is all about mountains and scenery and you will find stunning views everywhere. CBT (Community Based Tourism) can help you arrange transport and accommodation. I went to Altyn-Arashan and Jeti-Orguz, both located close to Lake Issyk-Kul. While the distance to the lake wasn’t huge, the valleys felt remote enough to get away from cities and civilization for a while. In both places, it is possible to stay in yurts and both valleys have excellent trekking and horse-riding options. 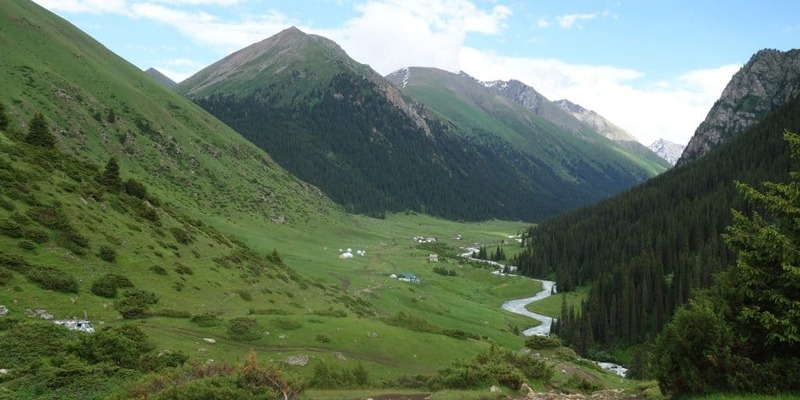 Altyn-Arashan is special because a few hot springs are located in the valley. With Kyrgyzstan being at high altitude, it can get cold here, even in summer, so you will enjoy soaking in a hot spring at the end of the day. Located at an altitude of more than 3000 meters, Lake Song-Kul is only accessible in summer. As soon as the snow melts, yurt camps pop up along its shore. You will find great hiking up here, with stunning views of the blue lake and snowcapped mountains in the background. I have mentioned yurts a couple of times already. 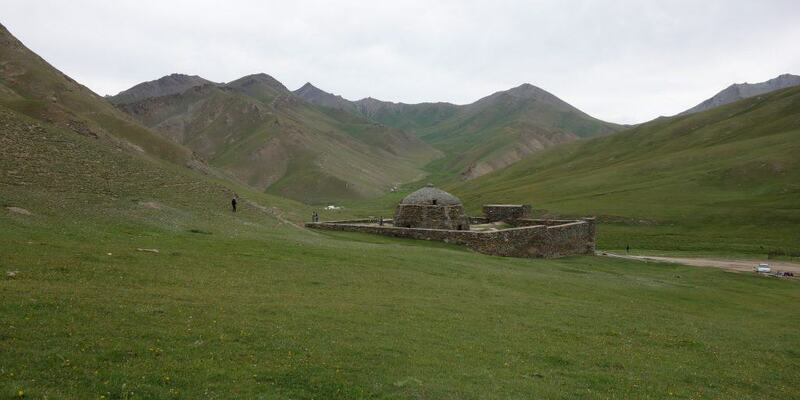 Arranging a yurt stay in Kyrgyzstan is easy, as you can find yurt camps all over the country. We stayed in yurts at Song-Kul and had all of our meals included. That way we got to enjoy traditional Kyrgyz food in a beautifully decorated ‘dining room’ yurt. 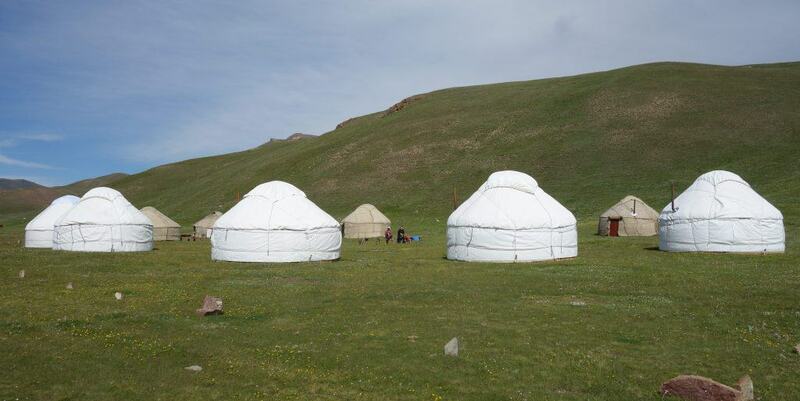 Yurt stays give you an authentic glimpse into Kyrgyz life and nomadic traditions. 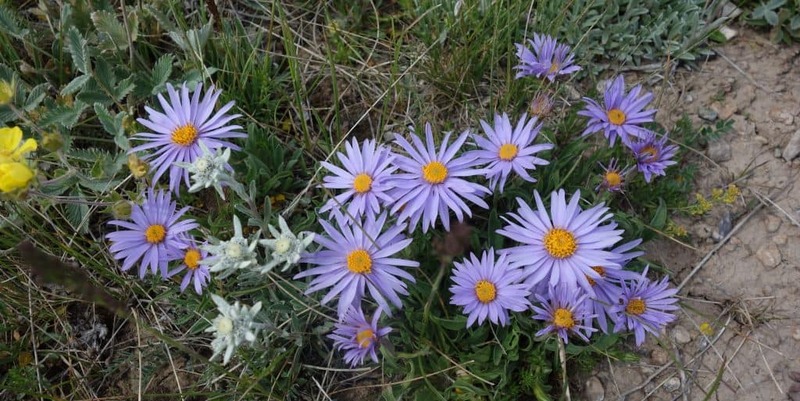 In June, Kyrgyzstan’s alpine meadows explode with colour as wildflowers blossom. We saw flowers in every colour you can imagine, yellow, blue, red, purple, all sprinkled across bright green meadows. Amongst the flowers, we even saw some wild orchids. It is a spectacle not to be missed. Not many Silk Road buildings remain in Kyrgyzstan. The Burana Tower near Bishkek is one example, and Tash Rabat is another. Built next to the Torugart Pass leading to China, it once served as a caravanserei. Traders would wait here for the snow to melt or recharge their energy before braving the high mountain pass. The building is more beautiful from the outside than the inside, but it is its historical significance that makes it worth visiting. 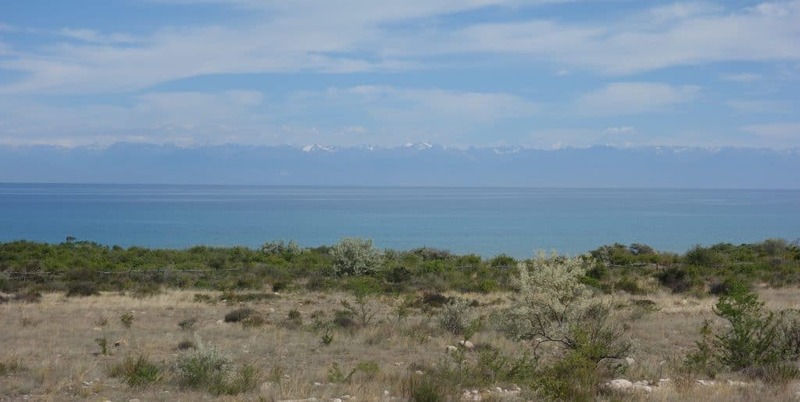 Lake Issyk-Kul is the second largest mountain lake in the world after Lake Titicaca in Peru. At an altitude of around 1600 meters, it is not a surprise that you can see snow-capped mountains behind the lake. Yet, even though located this high, the lake doesn’t freeze over in winter (Issyk-Kul means ‘warm lake’). Go for a swim in this lake or drive around its edge to enjoy the scenery. 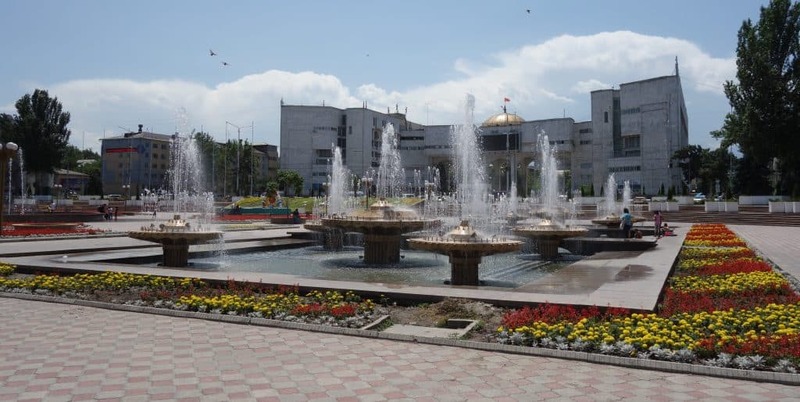 Bishkek is not a city filled with tourist attractions. But if you look deeper, you will find that there are a few things to do in the capital. Plus, after all the remoteness and time spent in nature, it is nice to get back into a city. If you haven’t travelled around the country yet, this is where you will meet other travellers and arrange your trip through CBT.